Something I’ve been looking to find forever has been a solid pair of headphones. The issue I come across with most is my ear size. Having very tiny ears makes finding the ideal headphones an ordeal. Between them either being too tight or just plain falling off, I always find myself frustrated when trying to enjoy music on my work commute or even when I’m gaming at home late in the evening. I was recently introduced to the Kaliber Gaming series headphones from IOGEAR and wasn’t sure what to expect. On paper many headsets and headphones can be extremely informative, but at the same time, when you have ear size issues, these concerns are rarely taken into account until it’s too late. For me, my biggest concern was the size. Upon opening the package, I was relieved to see and feel how sleek and compact the headphone design was. Keep in mind, as much as I use the term headphones, they are much more than that. On the surface, the Saga surround sound gaming headphones are exactly that. IOGEAR uses Dolby Pro Logic Virtual Surround Sound which can be turned on and off at the flick of a switch on the side of the headphones. For me, this was a bonus feature since I don’t traditionally use headsets/phones other than for chat. These came around at the perfect time however, since I just became a father on May 3rd 2016 to a healthy baby boy, this is just what I need when it’s late and he is taking a nap next to me. The main game I tested the headphones on was Uncharted 4 for PS4. This was a prime candidate to see how the Virtual Surround holds up. After an hour or so, usually my ears would begin to hurt, which in turn shortened my sessions. In the case of the Saga, I had zero ear aching and the surround, while not as full as you may get in let’s say the wireless Sony headset, hit all the right frequencies and dynamic ranges, all while still keeping me immersed in the world of Nathan Drake. 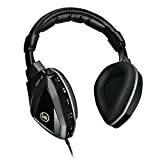 While I would like to hear more of the low end tones, I understand why the audio is balanced the way it is and I really think this headset is a great value for someone looking for a new set that can also use it as headphones for everyday use. As a musician, I tend to have an expectation of what certain music should sound and feel like via headphones. The amount of headphones I own is astounding, yet I “tolerate” a small few pairs. I say tolerate because each still have a flaw that takes me out of the experience. Size, sound, overall and cable design, weight and even color are very important factors when choosing the right headset. I took the headset for my commute for the last week or so to really put them to the test as I sit on a bus for three hours in a day at the minimum. My variety of music really helped push the features to the max. I have a lot of personal music I listen to that isn’t high quality recordings and internal amplifier helped boost the signal and allowed me to enjoy the tracks better than before. Another great feature of the Saga is passive mode. The headphones internal rechargeable lithium battery hasn’t died on me yet, but when it does, they kick into passive mode, which will still allow you to use the headphones sans Dolby, which can come in handy on the go. My overall experience with the Saga headphones was positive and while the audio lacks on the low end, more than makes up for it in features, comfort and value. Thumbs up.